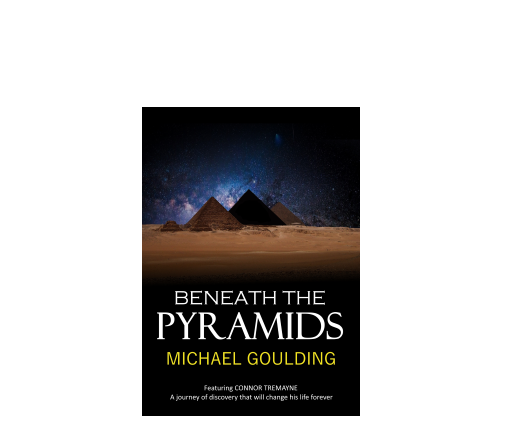 BENEATH THE PYRAMIDS Re-published MARCH 2019. The long awaited third story featuring Connor Tremayne. The background to 'Legacy Of The Sphinx' is an ancient mystery; perhaps one of the greatest mysteries of them all: what happened to Ark of the Covenant after the reign of Solomon, a thousand years before Christ? 'And I looked, and behold a pale horse: and he that sat upon him, his name was death. And hell followed with him.' Revelations Chapter 6, Verse 8. A book of ghost and horror stories in the style of one of the most famous pulp fiction series of all time: Weird Tales. A full-time writer and freelance journalist, who spent his early career in IT Sales and Marketing. After studying at Technical College and later the Open University, he qualified with a Business Studies Degree and a BA in Psychology. He began work in the 1960's during the formative years of the emerging IT industry, becoming a professional Systems Analyst and later an IT consultant spending time in both England and the U.S.A. with some of the leading British and American pioneering computer Companies: including NCR Limited, Honeywell Information Systems and the Digital Equipment Corporation of Maynard, Massachusetts. He later changed direction, moving into the Retail Licensed Trade in the UK and overseas, working initially in District Management with a major British brewery and later managing traditional inns in England for over ten years before gaining qualifications as a Trainer’s Trainer with the Hotel and Catering Industry Training Board. His first, full-length non-fiction book: "The British Pub Guide", sold well throughout the United Kingdom and is now a collector's item on Amazon. His first novel, "Legacy of the Sphinx", attracted much attention due to the basis of its plot: the age-old mystery surrounding Moses, the Ark of the Covenant and its disappearance shortly after the reign of Solomon at the turn of the first Century BC. The novel has long been available on Amazon Kindle where it remained in the Top 100 Romantic Thrillers for more than two years. A follow-up to this story was also published by Kindle entitled "Angel of Death", which in 2012, also entered the Kindle Top 100 Romantic and Suspense Fiction charts where it remained for several further years. The principal character in both books is Connor Tremayne, a disillusioned former Jesuit and professional assassin with a clandestine, Church-controlled organization formed originally within the Vatican but now headquartered on the eastern seaboard of the United States. In December, 2012, Kindle released a compilation of Michael’s original Ghost & Horror stories published in the “honorable tradition of Weird Tales” and entitled: "Shades of Darkness". “What mysteries lie in wait for us to discover beneath the Pyramids and the Great Sphinx we do not know. Nor do we know the original purpose of these great monuments including how they were built and who built them. For this reason, the theme of our story is necessarily a speculative one, and ‘Beneath the Pyramids’ supposes that hidden somewhere beneath the Giza Plateau in Lower Egypt in the long distant past is a legacy left by our predecessors to find when our evolution reaches a stage at which we are capable of recognizing and using the knowledge it gives to us. An ebook is an electronic copy of a book. Ebooks offer the convenience of size and portability; you can store your entire library on a laptop or other device. 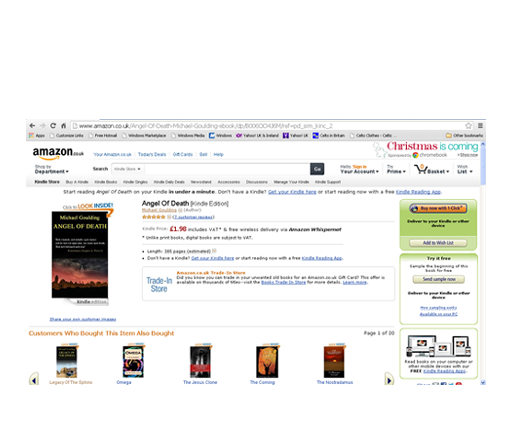 My books are available on Kindle. However, you do NOT have to purchase a dedicated ebook reader. You can read Kindle books on your computer, tablet, or mobile phone with Kindle reading applications. You can download a Kindle reading app for FREE at www.amazon.co.uk/kindleapps. Apps are available for iPad, iPhone and iPod Touch. For Android phone and Android tablet and for PC and Mac. You'll first need to register with Amazon.co.uk. 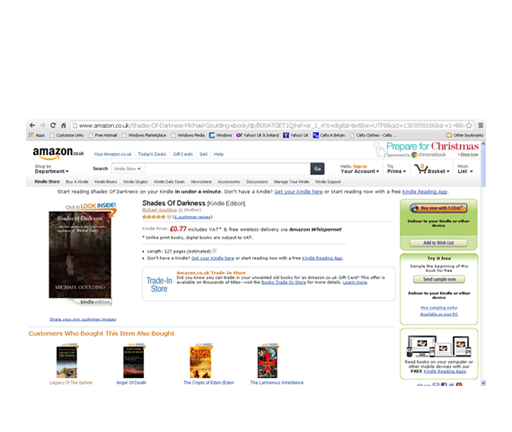 Then choose the Kindle Store and enter Michael Goulding for a list of my books. Whenever you choose another book from the millions available, it will then be delivered directly to you and be available for you to read forever and as many times as you please. Legacy Of The Sphinx. It'll blow your mind. 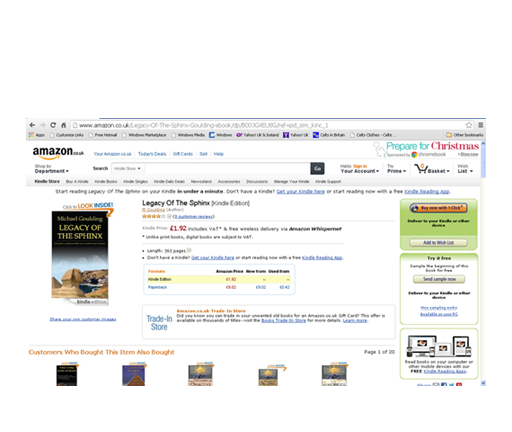 The background to 'Legacy Of The Sphinx' is an ancient mystery ;perhaps one of the greatest mysteries of them all: what happened to Ark of the Covenant after the reign of Solomon, a thousand years before Christ? The story is far more than just another biblical mystery. At its heart is a love story, between a disillusioned Jesuit priest, sent to Cornwall, England by the Vatican to find the remains of the original Ark of the Covenant, rumoured to be buried underneath the towering cliffs; and a young nun, still a novice and yet to take her final vows, whose parents tragically died young and who was transferred as an orphan and without her consent, into a Carmelite institution at the age of 15. Angel Of Death. See for yourself. 'And I looked, and behold a pale horse: and he that sat upon him, his name was death. And hell followed with him.' Revelations Chapter 6, Verse 8 Connor Tremayne, having found the love of his life, begins to plan his life around her. His profession however, leads directly to her death when she is murdered in the most savage way by professional killers. 'Angel of Death' is the story of his revenge and of how he meets a woman who becomes his new future. It is also the story of his most challenging assignment yet, when he is briefed to prevent the greatest threat the human species has ever faced: the potential release of an artificially created intelligent virus, that threatens to engulf and destroy us all. The long-awaited third story featuring Connor Tremayne. He is instructed to find a location said to have been left by our predecessors for the human race to discover when we have evolved sufficiently as a species to understand and use the knowledge they have bequeathed to us. Such a place has been speculated to exist for many years, and has become popularly known and written about as the fabled 'Hall Of Records'. And to find it, Connor must go beneath the Giza Plateau in Egypt. upon which the Pyramids were built. It is a journey of discovery that is about to change his entire life . . . Shades Of Darkness. Out now on Kindle.